﻿Natural: Made of natural elements, the substrate JMS is environmentally friendly. Light: Ultra light, its aerated composition allows to combine performance and creativity. Water tank: The water supply of the substrate JMS 'allows optimal hydration of plants over time. Without risk: The substrate JMS help maintaining the health of your plants. Thanks to its water and its aerated composition, plants have all necessary nutrients for their growth and their vitality. Composed of a rock subjected to a heat shock from 1 000 to 1 200 ° C, the substrate JMS protect your plants from a large number of bacterial and viral infections. The low density limit the constraints of weight and allows a wide variety of uses that leave plenty of room for creativity. Its high porosity facilitates contributions hydrating quickly, its water capacity is 'fluffy'. 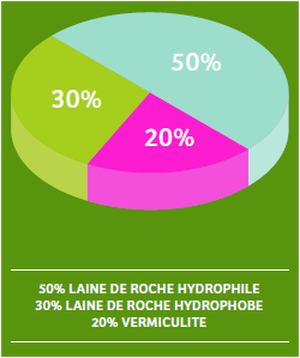 The substrate JMS has a strong capacity to retain water; the presence of water retention effect gives it a 'tank' complementary inputs but also limiting the fall in the wilting point pF, critical for the plant. This reserve facilitates integrated water distribution water multidirectional 'through which the roots are in the scope they need to grow nutrient solution in a perfectly balanced air / water ratio.